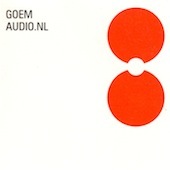 Following the succes of the Komet – Audio.NL CD, the second release to re-issue old records from the by the now legendary Audio.NL label involves the two 12” records by Goem, as well as the only 7” on that label by Goem and Jos Smolders. Goem started out late 1995 as yet another solo project by Frans de Waard who cobbled together a demo using an ancient device called the student stimulator (a basic pulse machine) and some sound effects. Intended to be just a few tracks/one-off project, it attracted attention of his fellow band member in Kapotte Muziek, Roel Meelkop. Together they reworked the demo and the resulting recordings were released as ‘Stud Stim’, the first foreign act released on Raster-Noton. Peter Duimelinks joined shortly after that, just before Goem’s debut concert in Barcelona in June 1996. From then onwards Goem released records on Mego, Staalplaat, 12K and Noise Museum and played concerts at Sonar, Mutek, Stop Stop, Ultrahang festival but also galleries, small clubs, squats and even a camping. In 1998 they started the Audio.NL, who released up to the early 2000’s some 30 different 12” records. After 2002 Goem ended, and Frans de Waard and Roel Meelkop each released a solo record as Goem after that. Goem’s trademark sound was a minimal, pulsating sound at first generated by the student stimulator, but later also expanded to other sampled sources, including disco records, which was fed through analogue synthesizers (Korg and Roland) and a bunch of sound effects. A highly hypnotic blend of moving, pulsating electronics, often mistaken for minimal techno, but reaching much more for the minimalist tradition of Steve Reich meeting Kraftwerk. This CD contains their two 12”s on Audio.NL, the ‘Motormix’ by Goem, a goem remix by Jos Smolders (both from the 7”, Audio.NL 003) and two previously unreleased tracks. All remastered from the original master recordings by Jos Smolders @ Earlabs.